Some yoga positions may stress your back muscles. Yoga offers several benefits, including burning calories, strengthening muscles and relieving stress. Sometimes your back may hurt after a yoga session, particularly if you're new to the exercise. In most cases home treatment is appropriate, but if pain persists or gets worse, contact your doctor to rule out a serious injury. If you recently switched up your yoga routine or are just beginning to practice, you might activate back muscles that aren't used to the movements required during a session. This may cause those muscles to be sore in the 12 to 48 hours following yoga. This pain is likely due to tiny tears in your muscles, which help your muscles gain in mass as they heal. Muscle pain after yoga is likely to go away after a few days. A yoga routine heavy on forward bending poses may also contribute to back pain, particularly if you use improper form. Most of the time, home remedies are effective for alleviating yoga-related back pain. The most important thing is to rest your back by taking a couple of days off from your yoga routine. To ease pain and eliminate swelling in the meantime, take an over-the-counter pain medication, following the package directions for proper dosage. Wrapping your back with a compression bandage is another way to limit swelling in the area. Apply an ice pack to the area for 10 to 15 minutes, several times each day to numb discomfort and cut back on swelling. In cases of a spinal problem, your doctor may prescribe physical therapy or even surgery to treat the condition. There is no guaranteed way to prevent yoga from causing back pain. However, following proper form and techniques during your yoga session reduces the risk of pulling or straining your back muscles. If you are new to yoga, ease into it to limit the stress on your back. As you continue with your routine, your muscles will gain strength and endurance and the incidence of back pain should be lower. In some cases, back pain after yoga may indicate something other than simple muscle adaptation. If the pain doesn't go away after several days or worsens over time, contact your doctor. If you experience redness at the site, a fever, back muscle weakness or trouble breathing, seek medical care right away. 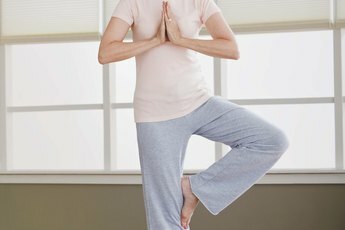 If muscle pain occurs during a yoga session, rather than several hours later, stop and call your physician. You may have strained or pulled your back.